The Antonine Guard have been re-creating history in schools for many years and have a number of members who specialise in school talks for children. We can normally cater for all years from P2/3 upwards and into S1/2, and can usually tailor the presentation to the requirements of the individual school. 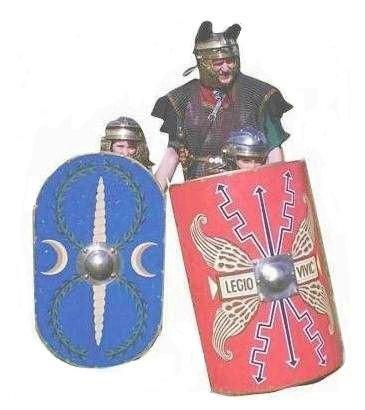 TAG members will arrive fully attired with weapons and equipment to portray a Roman Legionary of the period 1st/2nd century AD. Presentations will normally include discussion of a soldier's weapons and equipment; battle tactics, life and dress. Class participation is always encouraged and pupils are invited to participate in various Roman training drills. TAG are fully insured, risk assessed and are very aware of safety issues and the weapons themselves are always handled with the greatest possible care. Should you wish to talk to us further about what we can do for your school, then Contact Us to discuss your requirements. Please note there is a cost involved for these visits.